Our trout salad tastes so good with no time and minimal effort. It adds a special touch to any lunch or dinner and disappears fast down each and every time. This is a truly festive salad full of flavor and a great-tasting way to include fish in your menu. It is great for a speedy lunch or brunch and is quick to make for a houseful of guests. This delightful salad is nutritious and refreshing, and the Kalamata olives and olive oil add flavor to the filets. A tasty homemade salad to serve as an entree! Cut onions and trout fillets into small pieces. 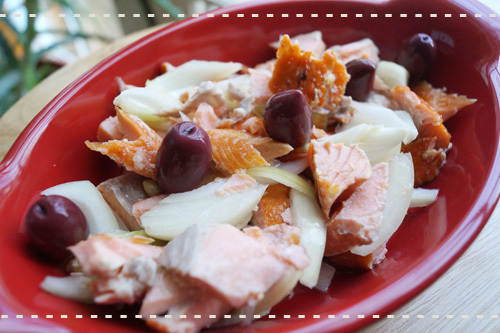 In a dish combine the trout, onions, lemon juice, olive oil and pepper. Top with olives and serve.